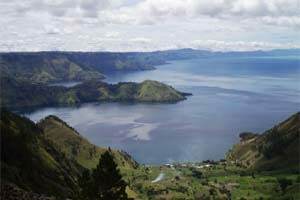 Lake Toba (Danau Toba) is a volcanic lake formed by a supervolcanic eruption around 75.000 years ago. 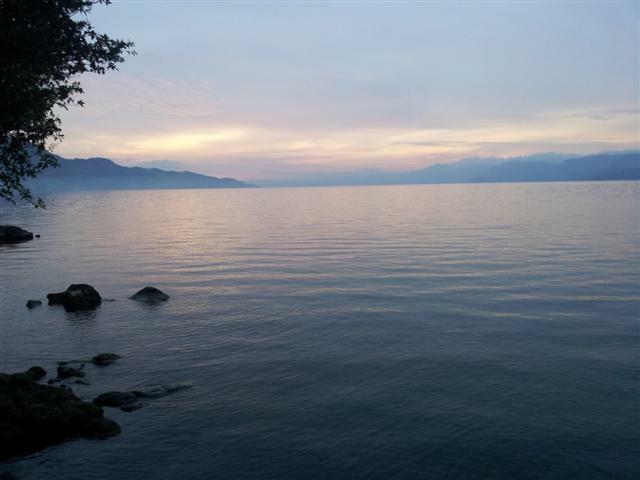 With a length of 100km and a width of 30km it is the largest lake in South-East Asia and also width a maximum depth of 505 meters also one of the deepest. Beside this it is the largest volcanic lake in the world. 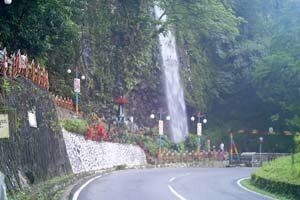 It is located in the northern part of Sumatra at an altitude of 900 meters. The supervolcanic eruption of Mount Toba which formed the lake obliterated the volcano and is believed to be the largest explosion in the last 25 million years. An estimated 2,800 km3 of rock was blasted from the mountain. 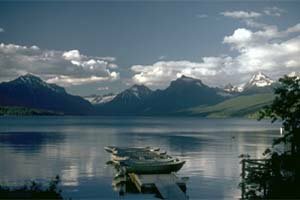 The eruption led to a volcanic winter worldwide with temperatures 3 to 15 degrees lower than normal. 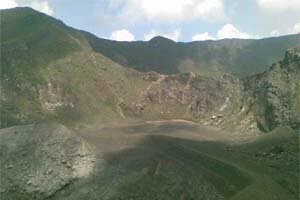 The eruption caused the mountain to fall in on itself and form a caldera that filled with water to become Lake Toba. 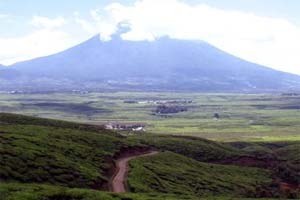 To comparison, the largest known eruption in recent times at Mount Tambora (also in Indonesia) in 1806, which lead to the "Year without a summer", released 100km3 while the eruption of Mount St. Helen in Washington State released an equivalent of around only 1.2km3. There have been smaller eruptions and earthquakes since then. Looking at the northwestern edge you'll notice the lack of vegetations probably caused by a recent eruption in the last few hundred years. The magma chamber below is refilling which causes parts of the caldera to be lifted. This has formed the Samosir island in the middle of the lake. Sediments show the island has been lifted at least 450 meters. 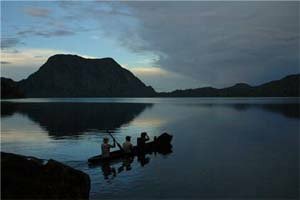 At the northwestern side of Samosir island is a small peninsula called Tuktuk which was once a very popular tourist destination but which has become very quiet in the last decade. 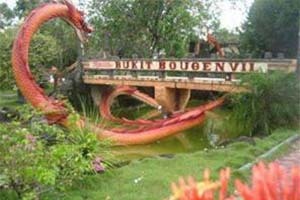 This has some advantages for example that prices for hotels and food are extremely cheap (room at the lakeside with big double bed and hot water for Rp 150,000) and development has come to a stand still. Staying in Tuktuk you can have a magnificent view on the lake and the outer craters walls. There are some things to do here, like swimming, hiking, driving around the island and there are some historic places to see, but mostly people come here to chill out and rest. From Medan you need to get to Parapat where you can get a boat which will bring you to Tuktuk. The boat ride (Rp. 7,000) takes about an hour depending on where you want to be dropped off. 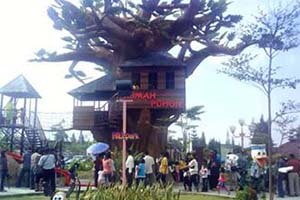 In Medan you have several options to get to Parapat. You can go by one of the minibuses (travel) leaving at one of the travel agencies in Jl. 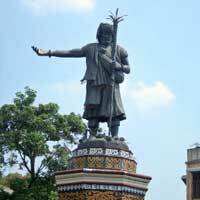 Sisingamangaraja or you can take the cheaper local bus (Rp. 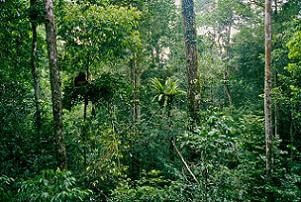 20,000 around 4 to 5 hours) leaving about every hour from the Terminal Amplas bus station. The roads are very bad so be prepared for a tiresome but in the end rewarding journey.